"The Impact of Air Pollution on Health,Agriculture and Technology" -Book edited by: Dr. Mohamed Khallaf ; ISBN:978-953-307-528-0 DOI:10.5772/1000- Full Chapter: Influence of the Air Engine on Global Warming Issues - 21st Century Fuel Technology - by Bharat Raj Singh and Onkar Singh InTech Open Access Publisher, University Campus, STeP RiSlavka Krautzeka 83/A 51000 Rijeka, Croatia, (Received 14 Oct 2010, accepted 10 April 2011 and published 30 Aug 2011), DOI:10.5772/16708. 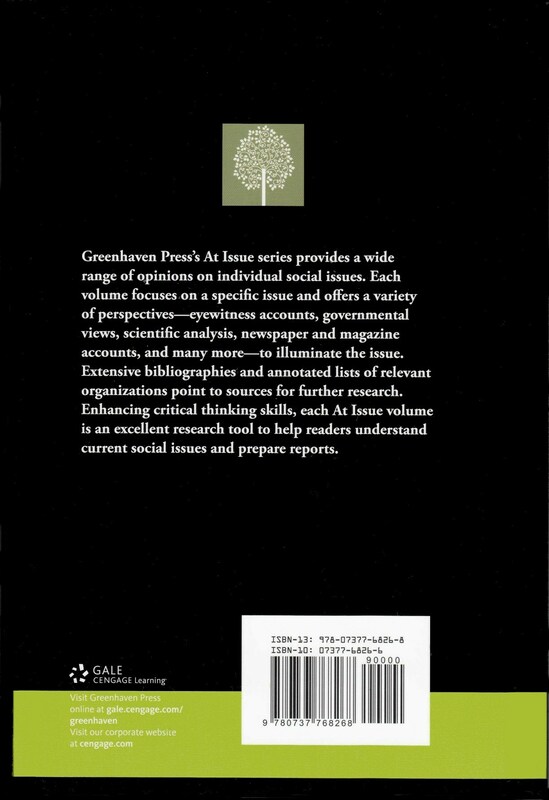 "Fossil Fuel and The Environment" -Book edited by: Assoc. 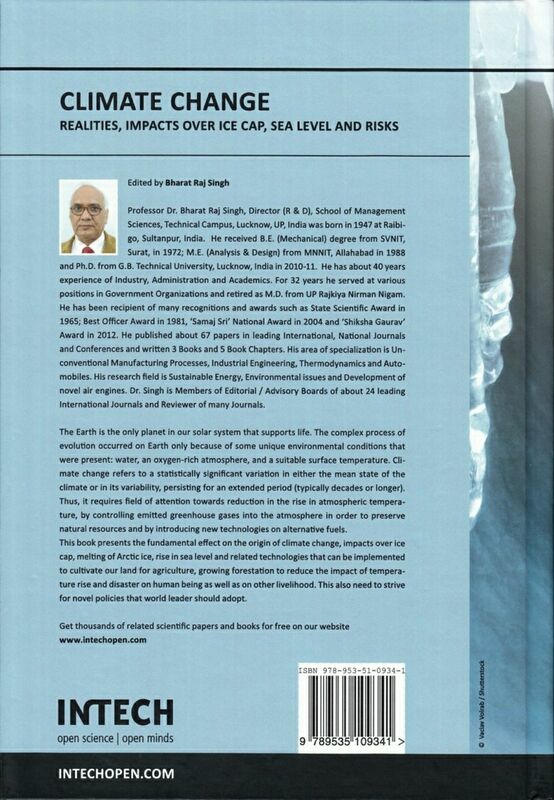 Prof. Dr. Shahriar Khan; ISBN 979-953-307-561-6, DOI: 10.5772/2315 - Full Chapter: Global Trends of Fossil Fuel Reserves and Climate Change in the 21st Century - by Bharat Raj Singh and Onkar Singh; InTech Open Access Publisher, University Campus, STeP RiSlavka Krautzeka 83/A 51000 Rijeka, Croatia, (Received 28 June 2011, accepted 14 December 2011 and published 14 March 2012), DOI:10.5772/38655. 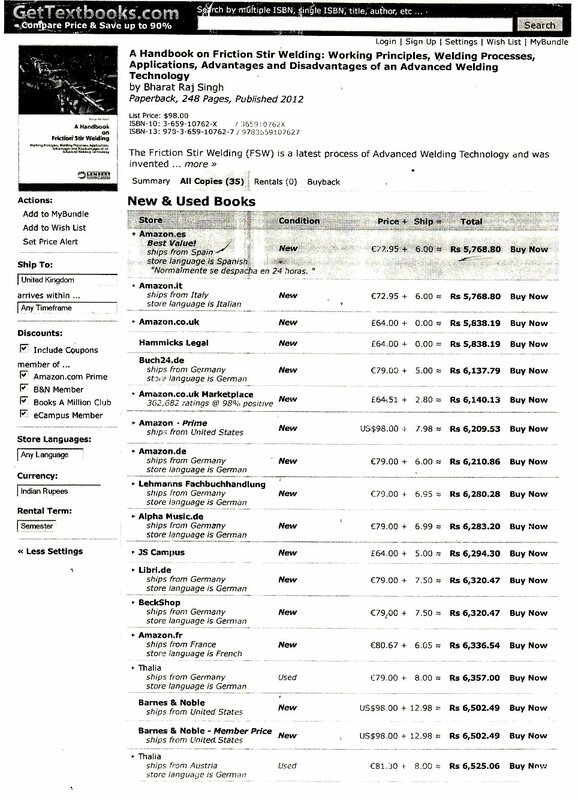 "A Hand Book on Friction Stir Welding"; ISBN:978-3-659-10762-7 - by Dr. Bharat Raj Singh Lambert Academic Publishing, GmbH & Co. KG, Germany, UK, (Received 29 Mar 2012, accepted 20 Apr 2012, published 05 Jun 2012), Project ID: #51805, LAP-Paperback Book 248 Pages, Price: 79,00 € (Euro)=5,462.34 INR. / eBook-Cover . mb! More Books, UK. / Booksprice.com - Books & Price Comparision. / GetTextbooks.com - Books & Price Comparision. / ISBNS.net - Book Price Comparision & Purchase. Landmark on the Net, India / BOOKadda, India / Infibeam.com-Books Online, India / India Book Store, India / Junglee.com, India. 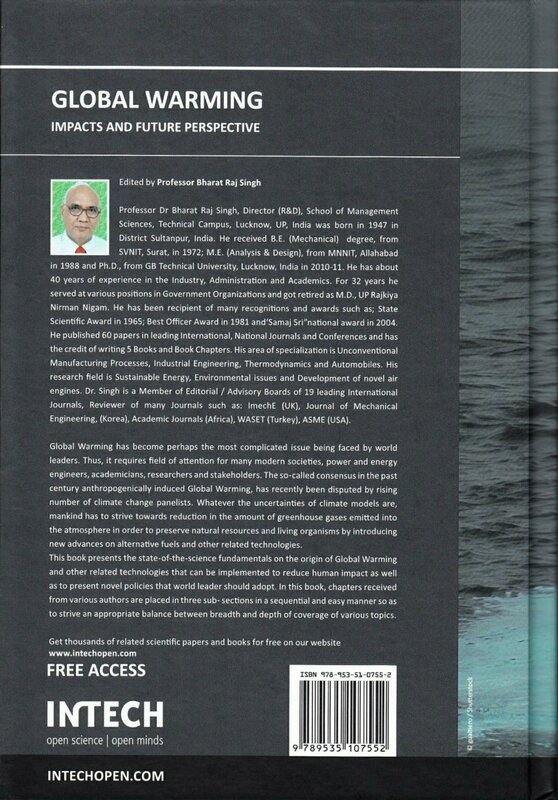 "Global Warming - Impacts and Future Perspective" -Book edited by: Prof. Dr. Bharat Raj Singh; ISBN:979-953-307-820-4, DOI: 10.5772/2599 Publisher: InTech; 352 pages, Price: 100,00 € (Euro)=6,700.00 INR. / Download: Free- eBook -Cover: Front / Back . i). 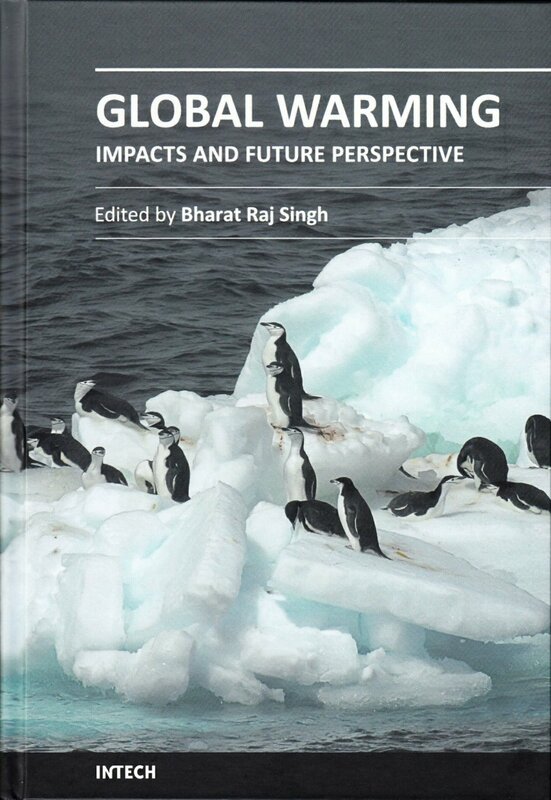 Study of Impacts of Global Warming on Climate Change: Rise in Sea Level and Disaster Frequency (Full Chapter)- by Bharat Raj Singh and Onkar Singh; InTech Open Access Publisher, University Campus, STeP RiSlavka Krautzeka 83/A 51000 Rijeka, Croatia, (Received 18 November 2011, accepted 28 January 2012 and published 19 September 2012), DOI: 10.5772/50464. ii). Impact of Uses of 3-Dimensonal Electronics IC Devices and Computing Systems on the Power Consumptions and Global Warming Issues (Full Chapter)- by Karl Cheng, Bharat Raj Singh and Alan Cheng; InTech Open Access Publisher, University Campus, STeP RiSlavka Krautzeka 83/A 51000 Rijeka, Croatia, (Received 1 December 2011, accepted 12 February 2012 and published 19 September 2012), DOI: 10.5772/52230. ISBNS.net - Book Price Comparision & Purchase. 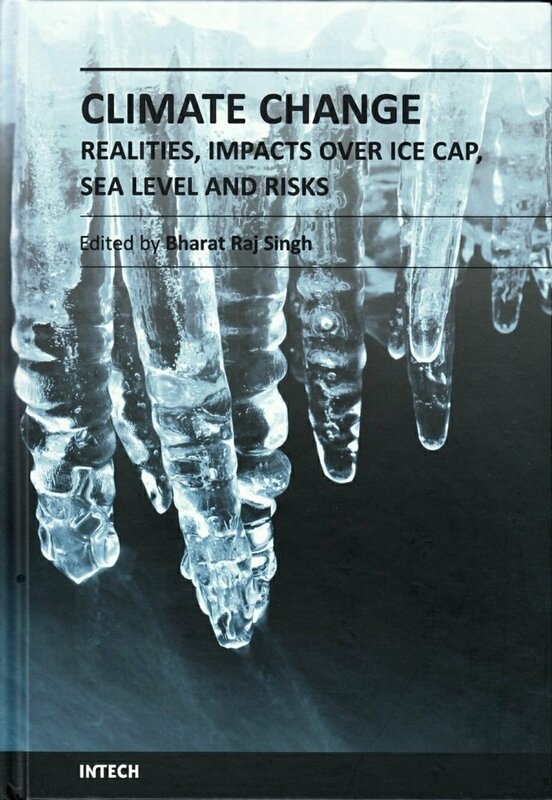 "Climate Change - Realities, Impacts Over Ice Cap, Sea Level and Risks" - Book edited by : Prof. Bharat Raj Singh; ISBN:978-953-51-0934-1, DOI:10.5772/3459, Publisher: InTech; 508 pages, Price: 100,00 € (Euro)=6,700.00 INR. / Download: Free-eBook -Cover: Front / Back . Primary audience is high school students, grades 9 through 12, in the US market but also sold to schools and libraries internationally---in Canada, the UK, Australia. What our Publisher: Gale Cengage Learning, USA- says? Cengage Learning, USA / Gale - Amazon.com- Online Books, USA / Galeschool.com-Online Books, USA / www.powells.com- Online Books / www.waterstones.com-Online Books, UK / www.bookdepository.co.uk-Books Online, UK / GetTextbooks.com - Books & Price Comparision. "Modeling and Simulation of Dynamics of Half Car Using Bond Graph", by Manoj Kumar, Bharat Raj Singh and MA Faruqui; ISBN:978-3-659-61086-8; Publisher-Lambert Academic Publishing, GmbH & Co. KG, Germany, UK, on 23 Sep 2014. GetTextbooks.com - Books & Price Comparision. 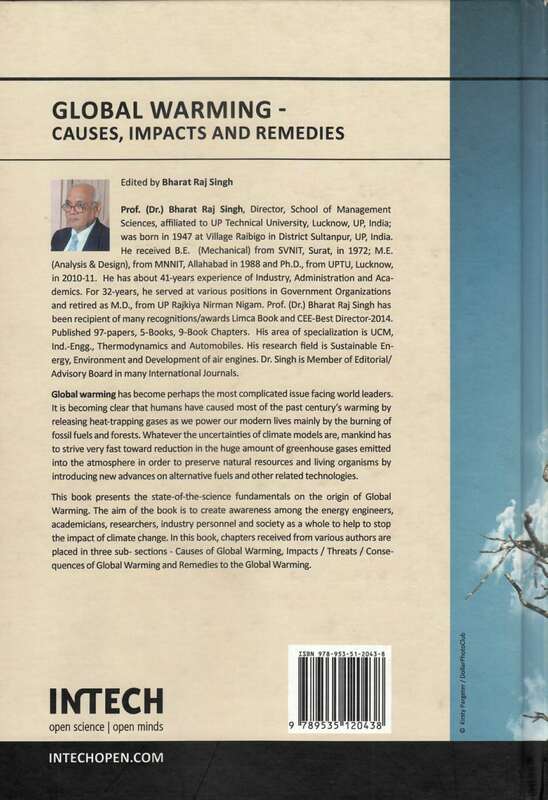 "Global Warming - Causes, Impacts and Remedies" -Book edited by: Prof. Dr. Bharat Raj Singh; ISBN:978-953-51-4123-5, DOI: 10.5772/58506 Publisher: InTech, Crotia.This book is published on April 22, 2015: Cover Pages: Front / Back . (i)Full Chapter - Study of Impacts on Continue Shrinkage of Arctic Sea & Sea Level Rise – Can Glaciers be Growing and Creating New Challenges to UK & USA? DOI: 10.5772/58766 - by Bharat Raj Singh and Onkar Singh; InTech Open Access Publisher, University Campus, STeP RiSlavka Krautzeka 83/A 51000 Rijeka, Croatia. 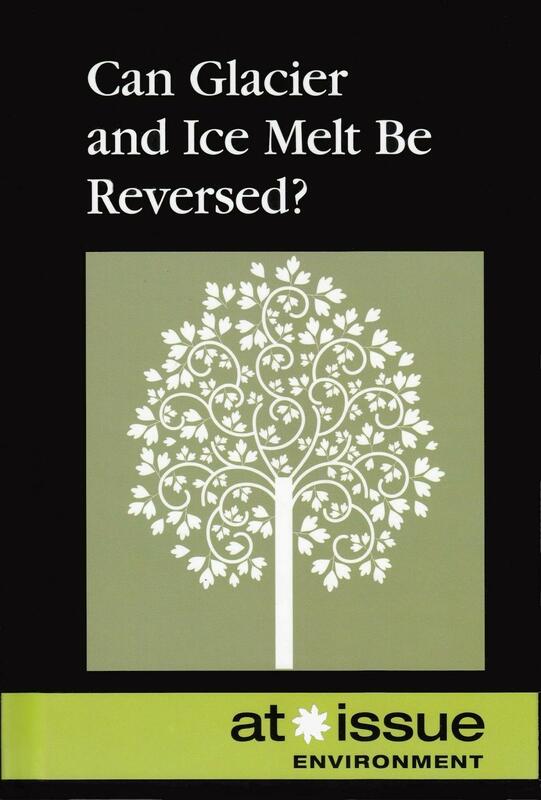 (ii)Full Chapter - Dire Consequences on Little Shifting of the Earth’s Spinning Angle – An Investigation Whether Polar Ice Shrinkage may be the Cause? DOI: 10.5772/58708 - by Bharat Raj Singh and Onkar Singh; InTech Open Access Publisher, University Campus, STeP RiSlavka Krautzeka 83/A 51000 Rijeka, Croatia. "Higher Education Facuty Career Oriented & Advancement" -Book edited by: Dr. Manpreet Singh Manna, Director, AICTE, New Delhi; ISBN:978-81-933475-9-1, Publisher: Center for Education Growth & Research(CEGR).This book is published in 2017: Cover Pages: Front . (i)Full Chapter-19 - Innovative Thinking & Internet Browsing - by Bharat Raj Singh, Director General (Technical), School of Management Sciences, Lucknow. 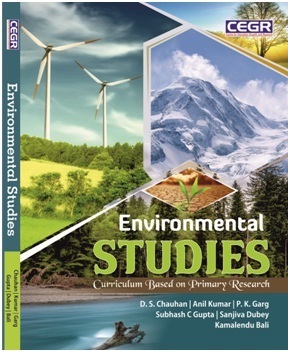 "Environmental Studies" -Book edited by: Dr. DS Chauhan, Dr Anil Kumar et al., CEGR, New Delhi; ISBN:978-81-933475-0-3, Publisher: Center for Education Growth & Research(CEGR).This book is published in Dec 2017: Cover Pages: Front . (i)Full Chapter-13 - Renewable and Clean Energy - by Bharat Raj Singh, Director General (Technical), School of Management Sciences, Lucknow. 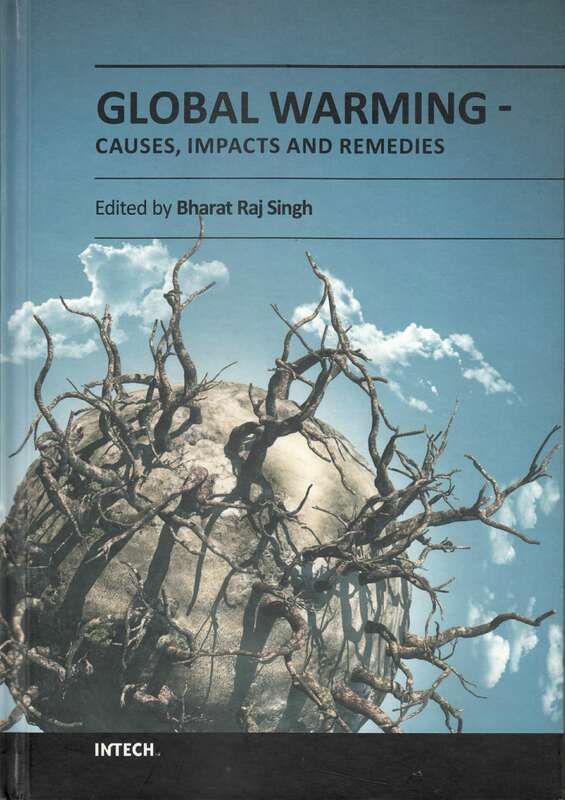 (ii)Full Chapter-15 - Civil Society and Environment - by Bharat Raj Singh, Director General (Technical), School of Management Sciences, Lucknow. "Research Methodolgy" -Book edited by: Dr. KK Agrawal, Dr Bharat Raj Singh et al., CEGR, New Delhi; ISBN:978-81-935740-2-7, Publisher: Center for Education Growth & Research(CEGR).This book is published in Dec 2017: Cover Pages: Front . (i)Full Chapter-7 - Methods and Techniques of Primary Data Collection Pages: 83-102- by Bharat Raj Singh, Director General (Technical), School of Management Sciences, Lucknow. (ii)Full Chapter-8 - Methods and Techniques of Secondary Data Collection Pages: 103-120- by Bharat Raj Singh, Director General (Technical), School of Management Sciences, Lucknow. 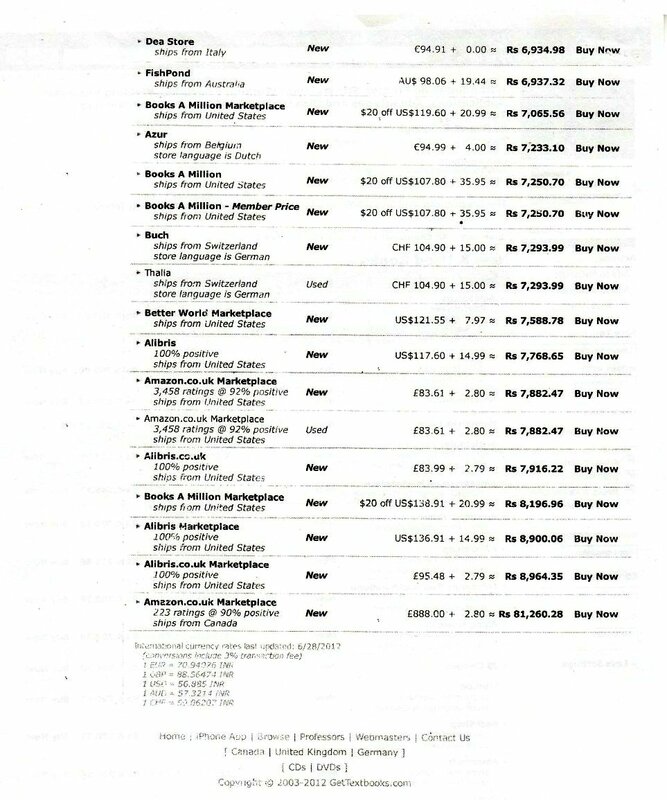 (iii)Full Chapter-12 - Parametric Tests Pages: 162-176 - by Bharat Raj Singh, Director General (Technical), SMS, Lucknow. (iv)Full Chapter-13 - Non-Parametric Tests Pages: 177-197 - by Bharat Raj Singh, Director General (Technical), SMS, Lucknow. (v)Full Chapter-21 - Data Validity & Reliability Pages: 331-350 - by Bharat Raj Singh, Director General (Technical), SMS, Lucknow. (vi)Full Chapter-22 - Big Data Usage in Research Pages: 351-367 - by Bharat Raj Singh, Director General (Technical), SMS, Lucknow. "Innovation Technology Management" -Book edited by: Dr. AP Mittal, Dr Prabhat Mittal et al., CEGR, New Delhi; ISBN:978-81-935740-3-4, Publisher: Center for Education Growth & Research(CEGR).This book is published in Dec 2017: Cover Pages: Front . (i)Full Chapter-4 - Innovation in Digital World Pages: 42-67 - by Bharat Raj Singh, Director General (Technical), SMS, Lucknow. (ii)Full Chapter-7 - Technology Transitions Pages: 90-118 - by Bharat Raj Singh, Director General (Technical), SMS, Lucknow. (iii)Full Chapter-10 - Developing Technology Strategy and Adoption Pages: 142-167 - by Bharat Raj Singh, Director General (Technical), School of Management Sciences, Lucknow. NOTE: "Find books written by- Prof. Dr. Bharat Raj Singh on Worlds leading books sellers: Amazon.com & Barnes & Noble . "Rotary & Vane Type Air Engine" -Patent office, Govt. of India- Registered on 08-10-2010,vide No: 2412/DEL/2010; Notified on 13-04-2012 vide: Issue No. 15/2012 Friday Date: 13th April' 2012 -Page 5783 by Patent Office, Govt. of India- Download Journal Part-1.